A "renga" is a collaborative poem based on the Japanese haiku form, often about nature. 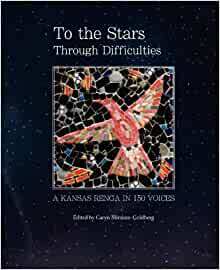 In To the Stars Through Difficulties: A Kansas Renga in 150 Voices, poets in the chain take readers across the mythological as well as physical landscape of Kansas. Each poet begins with the seed of an idea from the poem before, writes, and leads the way for the next poet, all the way to the end. The group includes all poets laureate of the state, professional writers, and newcomers. Poets blend traditional and experimental approaches. The result is a unique chorale of beauty and surprise. The book follows the model of a similar United State poets laureate collection, Crossing State Lines, but with focus on one shared region. The writers celebrate startling beauty of the grasslands and its brilliant skies, including dimensions of reverie as well as plein air descriptions. The poets follow images and questions threading through the unfolding form of the renga, creating together one winding poem, a river of words on what place can and does mean. Poetry to celebrate Kansas 150 years of statehood, Wonderful! Different points of view and appreciations of life in Kansas. A very interesting read. 5.0 out of 5 starsInteresting!! !